Every year, without fail, the local asparagus season surprises me. I know what it tastes like and I know how I like to eat it, so why should it catch me unawares? I think the answer is that I also end up eating asparagus at other times of the year. Sometimes it’s in restaurants that claim they build their recipes around local, seasonal produce. But asparagus in London in November? I think not. Then it appears in stir fries and risottos: thin, woody, tasteless stalks from Peru or Thailand. Pah! Sometimes, like a fool, I even buy it myself. So, every year, when the really good stuff comes around in May, I’m taken aback all over again at how fresh, juicy and earthily green, local in-season asparagus can be. The problem is that after a few meals of it I can get bored. I know the season will be over soon, but I’m tired and I don’t want another risotto, or another plate of steamed asparagus with new potatoes, or the stalks chargrilled with a grating of parmesan… etc etc. So, each year I come up with something new. 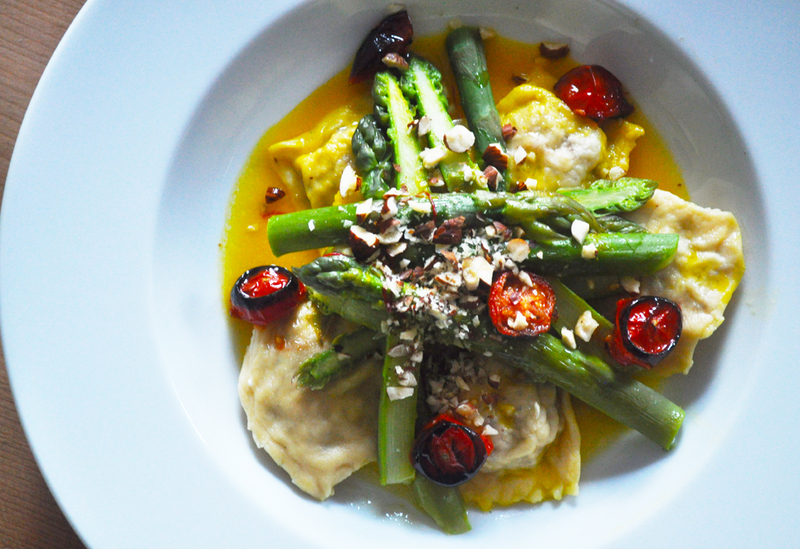 Last year it was asparagus egg and chilli tomato. 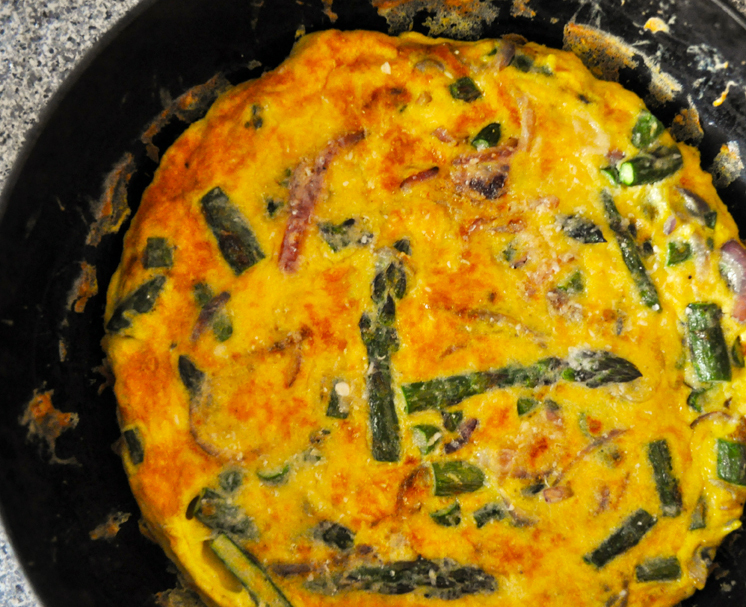 This year, a quick lunch of an asparagus-based fritatta. (Look carefully and you’ll notice that we kept the winning combination of the veg, eggs and cheese and simply reformulated it). So easy it hardly needs a recipe, we made this as a man from the phone company was fixing our broadband. Amounts, and the size of the pan, will depend on how many you want to feed… I’ll leave it up to you. First, finely slice a red onion and begin to fry it gently in a little olive oil in a frying pan. Cook until it has softened – around 8 minutes. While it’s cooking, roughly chop the asparagus stalks. If they’re thick, halve them lengthways too so that they don’t take too long to cook through. Add them to the pan and cook for a further 8-10 minutes. Beat some eggs and season with a black pepper. Next, grate a handful or so of parmesan and mix it into the eggs. Add to the pan. Stir a little, coating the asparagus and onion – try to distribute the veg evenly through the egg mixture. Leave to cook on a low heat. Turn on your grill to high. When the edges of the frittata begin to crisp and turn gold but the top is still not quite set, take the pan off the heat and hold under the grill to set the top. When it’s gold, you’re done. Yes, it’s been quiet over here at ETP Towers. Actually, scrub that: it’s been busy. Day jobs and gatherings with family and old friends have taken us away from the kitchen rather a lot recently. 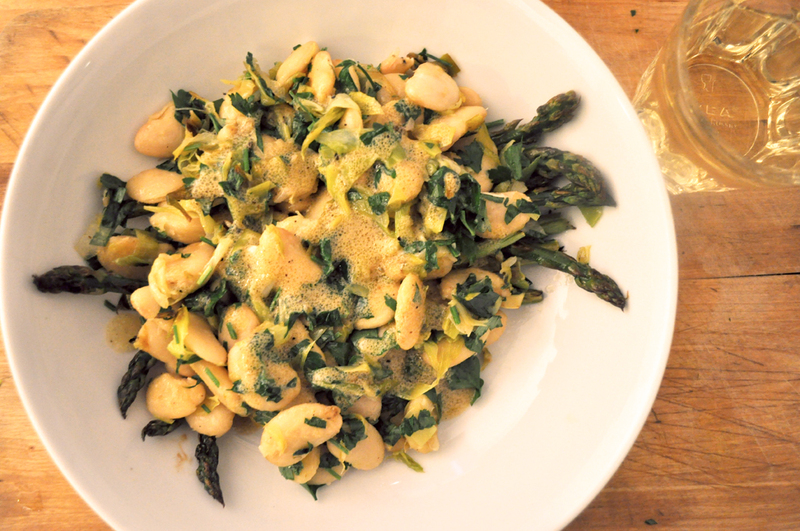 One thing we haven’t missed out on, however, is new season asparagus. A trip to the Cotswolds brought us almost to the Vale of Evesham, where some of the UK’s best asparagus is grown. We had some and my was it good. If you’re bored of steaming, boiling and grilling those sweet green stalks then (generally meaty) chef Mark Hix has another way of getting your fix: eating asparagus raw. It also marks a second appearance of radishes on this blog. Yippee! The recipe is utterly simple, totally tempting and over here. 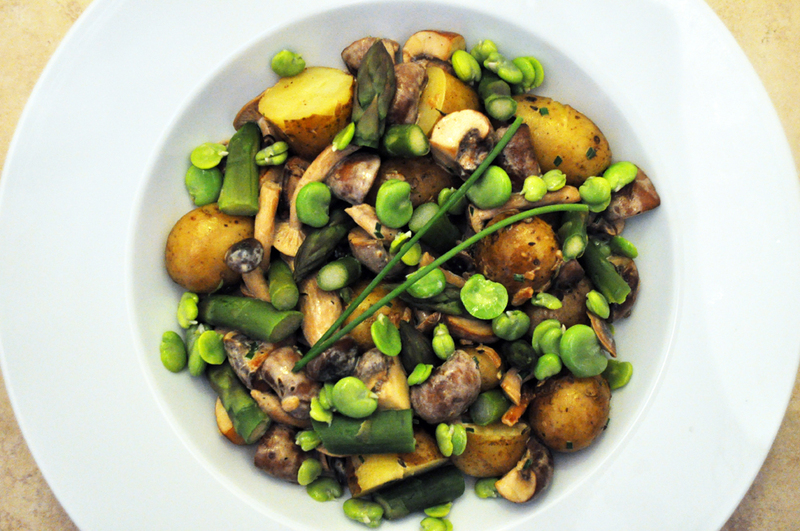 We invented this dish as a result of wanting to bring three in-season ingredients together in one dish: asparagus, broad beans and lovely baby Jersey Royal new potatoes. Simple, with the addition of some lightly cooked button mushrooms and some careful arranging on the plate. It really does look so fresh and vibrant with the joys of early summer that it deserves some TLC as you’re plating up to capture the glorious colours and make each mouthful a true representation of the dish. You’ll no doubt know how to cook each of the ingredients here and with this dish they remain cooked separately and only brought together on the plate. So, first, get your new potatoes boiling (slice in half any that are larger than a mouthful). You’ll want about 7 or 8 small potatoes per person. Then boil a couple handfuls of podded broad beans for three minutes. Drain and slip the little green beans out of their withered outer cases. Set aside. Now steam four asparagus spears per person until they’re just about tender, chop into bite-sized pieces and set aside. Finally, fry a few mushrooms per person in a little olive oil with a finely chopped clove of garlic. Add a squeeze of fresh lemon as they’re frying. When they’re nearly done, add a little single cream, mix in, season, mix again and take off the heat. With the potatoes done, plate up quickly. Start with the largest items (potatoes) and leave the smallest (broad beans) to last, making sure to intersperse each item attractively around the plate. And there, you’re done. One last tip – it’s really important not to overcook a thing on this plate. A plate of grey slop just won’t cut it. Eat and enjoy. We did! English asparagus at this time of the year is the best proof possible that eating vegetables in season makes sublime sense. Steam it and serve with some Jersey Royal new potatoes and a little butter – perfect. Then there’s the Jamie Oliver inspired chargrilled asparagus and parmesan salads that became popular a few years ago. We also like asparagus with a poached egg on top. But what else to do with this handsome stem? This easy supper brought two dishes together – the complementary pairings of asparagus and egg, and egg in a setting of a spicy, tangy, chilli-infused tomato sauce or jam. The chilli tomato here was literally a large handful of halved cherry tomatoes, softened ever so slightly in a little olive oil with the addition of some chilli flakes. 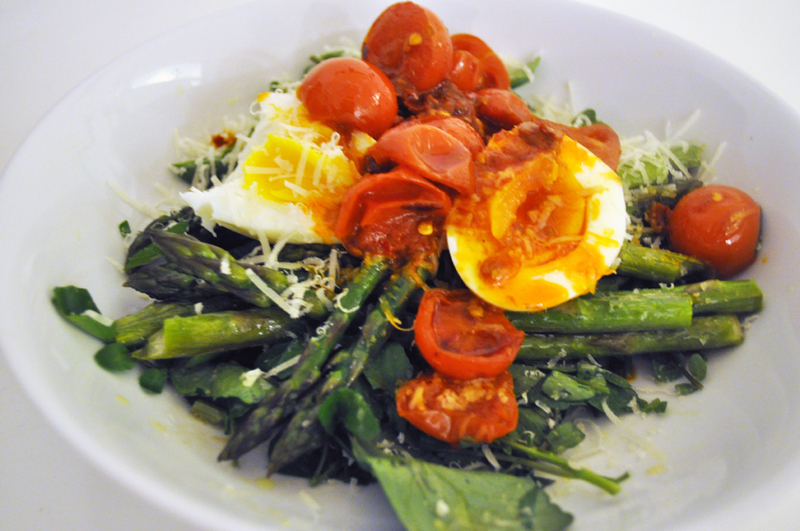 The tomato ‘sauce’ is poured over a halved soft-boiled egg, which sits atop some spears of griddled asparagus, which sits atop some roughly chopped watercress (spinach or gem lettuce would be fine). And yep, we sprinkled some parmesan shavings on top at the end. Easy. I was inspired by a feature at rufusguide.wordpress.com to make a risotto and, what with it being Spring, some light, fresh greens seemed the thing to add. I love a risotto with in-season British asparagus and peas – all just al dente so you get a little crunch among the nutty grains of rice and oozing, savoury sauciness. I added some baby spinach leaves to this risotto, too. Rufus gives a pretty good assessment of how to make a good risotto here. I’ll just add that no one wants a risotto the texture of rice pudding, so don’t overcook it. 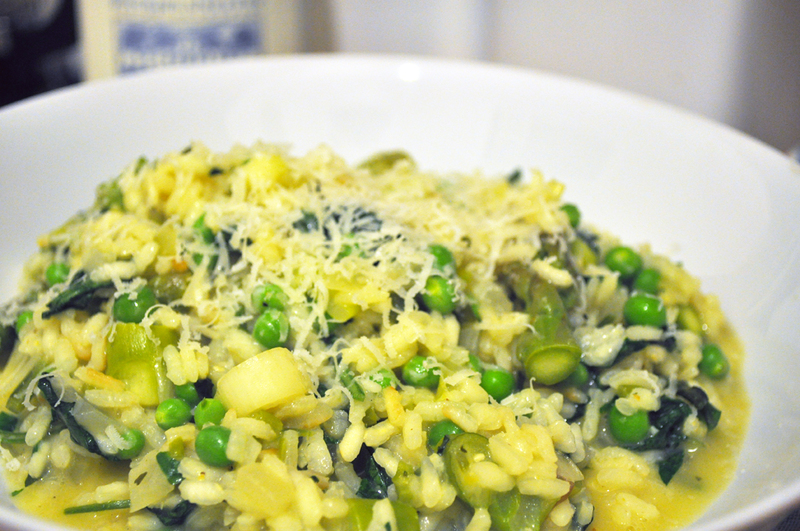 Neither should it be claggy – please don’t bake your risotto as Delia Smith does. The grains should be loose but still have, I think, the tiniest bit of bite to them and, while creamy, it shouldn’t be sweet – think savoury and season accordingly but carefully. A rich flavour needs develop in the liquor that thickly surrounds the grains – this will usually be a combination of olive oil, butter and parmesan, added as the rice settles after cooking. 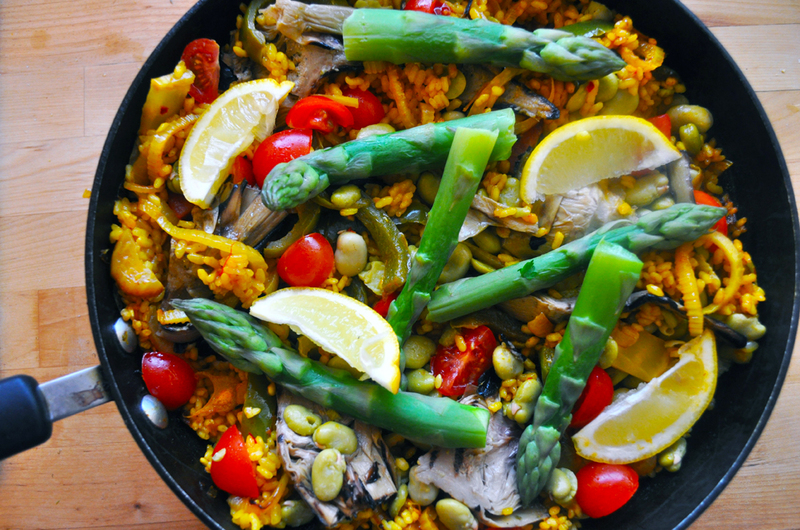 And lastly, in most cases, don’t add all your vegetables (whether asparagus or mushrooms or tomatoes, among many) as the rice starts to cook. Greens can be added near the end; mushrooms – for a mushroom risotto – can be pan fried first and scattered on top to serve, as long as you cook the rice in a stock made with dried mushrooms; tomatoes too can be run through the rice at a late stage – so roast them perhaps, with thyme or rosemary, or make a small tomato sauce to stir in. The options are endless. And lastly, for the love of food, please use proper risotto rice. Long grain rices and paella rices are all very wonderful, but no use whatsoever for risotto.